Osteoporosis, a common bone disease, affects women about 80 percent of the time. This often leads to the mistaken assumption that men aren't affected by the disease. Men actually need to be more vigilant in screenings for the disease since it can easily be overlooked and the onset generally occurs later. There are no national guidelines suggesting regular screenings for men so many don't seek out tests that could confirm a diagnosis. The National Osteoporosis Foundation estimates that one in four men over the age of 50 will break a bone as a result of osteoporosis. Men are also more likely to die within a year after breaking a hip because of problems related to the break. "This is cultural. It does occur in men," said Dr. Robert Tan, a clinical professor of family and community medicine for the University of Texas Health Science Center at Houston Medical School and director of the Opal Medical Clinic. "It's seen more often in women, but that's not to say that men don't get it. Their drop in bone integrity is much more gradual," Dr. Tan said. "It's an astonishing thing. Men are three times more likely than women to break a hip, but it is often neglected in men because we don't pay as much attention." 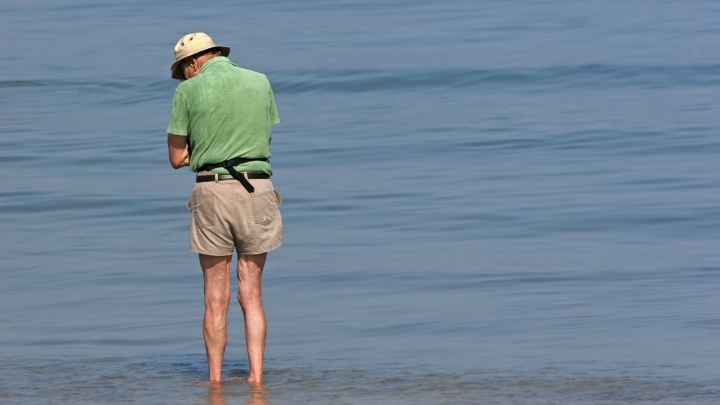 The mortality rate is higher in men with osteoporosis, but the process is slower. About 2 million men are currently living with osteoporosis, and an additional 12 million are at risk, according to the National Osteoporosis Foundation. Men also are 50 times more likely to develop osteoporosis than they are to get prostate cancer, which men tend to receive screenings for on a more regular basis. Dr. Tan theorized that men are not tested and treated for the disease as often because it tends to occur later in life and at a more gradual pace. And since there are no national guidelines suggesting men should be tested, some doctors may not think of testing men as often. Men that are most at risk are those that smoke, drink alcohol, have low testosterone, use steroids, or have emphysema or Chronic Obstructive Pulmonary Disorder. Lack of exercise and family history also can put men at an added risk. Osteoporosis occurs when bones have lost density or mass. Most often it occurs slowly over a period of several years. It's a result of the body failing to form enough new bone, when too much old bone is absorbed by the body, or a combination of both, according to the National Institutes of Health. Lack of calcium can be a contributor to the bone loss, but once the bone has been lost, there is no way to reverse the process. It mostly affects women. The leading cause is a drop in estrogen following menopause, or a drop in testosterone in men. Women are most at risk after 50, while men tend be at a higher risk at the age of 70. Risk factors include vitamin D or calcium deficiency, family history, hormone treatments, low body weight, cigarette smoking and alcohol consumption. There are two types of osteoporosis -- one that is modifiable and one that is not. The latter is simply impacted by genetics and age. Europeans, Asians and blacks also are more likely to develop osteoporosis. In helping reduce risk of acquiring the bone disease, Dr. Tan suggests exercising regularly and including plenty of vitamin D in your diet. It also is important to consume plenty of calcium and protein. Lifestyle changes, he said, can make a significant difference in reducing disease risk. Weight bearing exercises such as running or dancing, rowing, or balance exercises such as yoga can be particularly beneficial. Those with osteoporosis are advised to avoid twisting exercises such as tennis, according to the National Osteoporosis Foundation. Osteoporosis is generally diagnosed through a bone mineral density test through simple imaging technology that computes bone density and compares it against the average bone density for someone of a similar age in the general population. Some patients voluntarily request the test after noticing that they have gotten shorter, developed a stooped posture or have pain and tenderness as the vertebral spine collapses, but often there are no symptoms. "Lots of times it's diagnosed after the fact," Dr. Tan said. "We suggest scans after 65 for females, but sometimes physicians miss it. They have so much to do, such as mammograms and checking blood pressure." It is common that the disease may not be diagnosed until it already is in an advanced stage, and the patient has experienced a broken bone, such as a hip fracture, after a fall. Those with osteoporosis are most likely to break a bone in the hip, spine or wrist. "As they age, (patients) tend to lose their balance. They cannot see or hear as well, and this contributes to falling. There's also a loss in their sense of perception," Dr. Tan said. "Older patients may also be on other medications, such as for blood pressure that can make them more likely to fall." Medication is the most common treatment for Osteoporosis. Patients often take drugs that help strengthen the bones, and some take medication to ease the pain. The most common type of of drugs for osteoporosis are bisphosphonates, used to prevent and treat the disease in postmenopausal women. Popular drugs include alendronate (Fosamax), ibandronate (Boniva), and risedronate (Actonel). Most are taken orally, between once a week and once a month. A procedure called vertebroplasty may be used to treat small spinal column fractures or prevent fractures in weak areas of the spine. During the procedure a quick drying glue is injected into fractured or weak areas. A procedure called kyphoplasty, an invasive surgical procedure where doctors repair collapsed bone using balloons to widen spaces before adding glue, is also an option for patients unable to relieve debilitating pain and discomfort through medication. Though the procedure can be successful, spine bone loss is generally only repaired in one or two areas, and if bone from several areas in the spine have deteriorated, it could help only marginally. There also is a chance that the bone could again deteriorate to the point that the surgery is needed again. Only a small percentage of patients elect to try the surgical procedure since most are able to manage the pain with medication. "Some people have residual pain. It's not a magic bullet," Dr. Tan said of kyphoplasty. "Most people say 'I'll live with it. I'll just take medication. The risk/benefit ration is quite different than something like cancer." National Osteoporosis Foundation National Institutes of Health, "Osteoporosis"